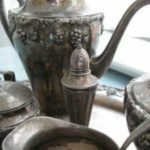 Whether it’s your grandma’s silver ring that you love but never wear or the good silverware you only bring out for holidays, chances are you have pulled your silver out of storage to see it dingy and tarnished. Tarnish develops through oxidization, affecting the top few layers of your metal, but how can you keep this from happening? Prevent tarnish from developing by choosing the right storage option for your silver. Tarnish preventative bags are one of the easiest options to keep your items tarnish free. Usually made of flannel fabric, these bags are treated with silver nitrate to keep your silver bright and clean. Storing it in a dry, cool environment can also help to prevent the oxidization process. Instead of throwing away the silica gel packets that are found inside sneakers and purses when you purchase them, store them with your silver. These bags will absorb excess moisture in the air, keeping the storage area low in humidity. Clean your silver with everyday household products, aluminum foil and baking soda. Start by placing a piece of aluminum foil (shiny side up) in a bowl. Place your tarnished silver on top of the foil and pour boiling water and a few tablespoons of baking soda into the container to make the tarnish transfer from the silver to the aluminum foil. Once your silver is clean, take it out of the mixture, rinse with water and dry with a soft cloth. Avoid using this method on jewelry containing gemstones. Create a paste of cornstarch and water to clean your silver. Apply the mixture with a damp cloth and allow it to dry before rubbing it off with a towel or cheesecloth to reveal a silvery shine. Leave your silver to soak in a mixture of vinegar and baking soda. Place ½ cup of white vinegar and 2 tablespoons of baking soda in a bowl with your tarnished silver, leaving pieces to soak for at least two hours. Rinse silver clean under cold water and wipe dry. Have some hard-to-clean jewelry or a piece containing gemstones? Stop into Garner’s Jewelry to have your silver professionally cleaned at our Taylor, Michigan location.